If you've filed for bankruptcy protection, you benefit from an automatic stay of collections by your creditors. This stops any pending lawsuits against you; at the end of the case, the court will discharge (cancel) your debts. If a default judgment is in effect when you file the bankruptcy, the debt may be discharged -- but there are conditions and exceptions. 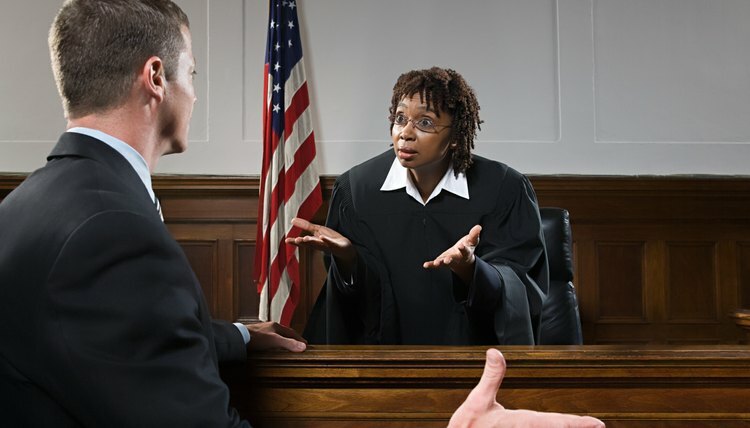 If you're the defendant in a civil lawsuit over debt and you fail to respond or appear for a scheduled hearing, the court will normally issue a default judgment in the plaintiff's favor. This effectively closes the case and allows the plaintiff to proceed with legal remedies, including garnishment of wages, bank levies and liens on your property. You can move to have the judgment vacated, but will have to show good cause for your failure to respond to the suit. When you file for bankruptcy protection, you're requesting the protection of the court against lawsuits and collection actions. If the default judgment was entered before you filed, it is classified as "pre-petition" debt and becomes part of the bankruptcy "estate" that includes your liabilities and non-exempt assets. As part of a bankruptcy filing, you must list the judgment and outstanding balance owed on a form. In Chapter 7, a court-appointed trustee liquidates your non-exempt property to pay your creditors. In Chapter 13, a trustee sets up a partial repayment schedule, which will include your judgment creditor. If the judgment debt is dischargeable, you can lose it in bankruptcy. But if the judgment relates to non-dischargeable debt, that liability is not going anywhere and you will still owe any unpaid balances in full when the bankruptcy case ends. This class of debt includes child support, alimony, back taxes, student loans, the proceeds of fraud, and criminal fines and restitution. In addition, any "post-petition" default judgments on debts you incur after filing the bankruptcy petition are legally enforceable, whether the debt is classified as dischargeable or not. A bankruptcy court can discharge debt, but you must move the original civil court to vacate, or set aside, the default judgment. This is a common outcome for judgments relating to credit card balances, medical bills, installment loans, and secured debt such as car loans (if the collateral is worth the same or less than the bankruptcy exemption amount). The bankruptcy stay will also put an end to bank levies and garnishments. However, a property lien created by the default will survive, and you will need to file for a release of the lien with the recorder of deeds or other appropriate agency.